A sister restaurant to Gourmet Dumpling House in Chinatown, Dumpling House just opened on Mass Ave, halfway between Harvard Sq and Central Sq. The menus are nearly identical. They only take reservations for parties of 5 or more, so I was worried about the wait for 6:30pm on a warm Saturday night. But, fear not, the dining room was only half full and we were seated immediately. By 7pm, the restaurant was packed, mostly with Asians, and there was a line out the door. It seems like Steve and I have a standard Chinese restaurant order, as we have had almost the same exactly 5 dishes at Gourmet Dumpling House, Dumpling Café and Szechuan’s Dumpling. 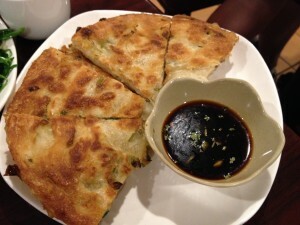 Scallion pancakes ($5.25) – These were crispy and flaky, but I thought they lacked in scallion flavor and were a tad greasy. Steve had no such qualms and had the majority of the dish. 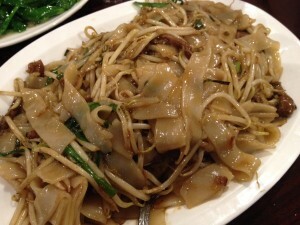 Flat noodles with beef ($8) – These are more commonly known as beef chow foon. These were an excellent rendition. The noodles and beef were tender, flavorful and not too greasy. Steve loved the noodles and proclaimed it his favorite dish of the night. 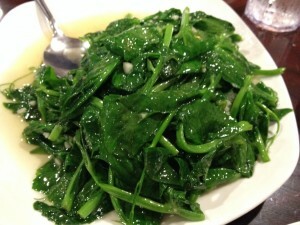 Sautéed peapod shoots ($14) – I always order these greens, despite the high price tag and they are always delicious. 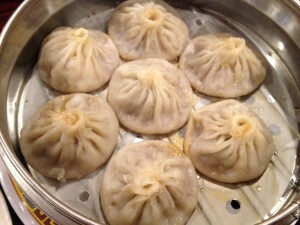 Mini soup dumplings with pork ($7.25) – These soup dumplings were only ok; I still think dumpling café has the best. The skins were slightly too thick and the filling too dense. 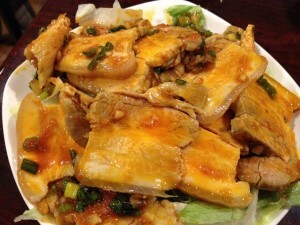 Lastly, we had the steamed bacon with garlic ($7), and it was awesome. I loved it. I was surprised that it was a cold appetizer, but it added to the dish. In fact, this is the first time I ever thought that bacon was refreshing. The meat is slicked with red chili oil, so I was worried it would be too spicy, but it only has a hint of heat from the fresh garlic. It’s not for everyone; Steve had one piece and declared he did not like it, which meant more for me. I ate the whole thing; the only one of the five dishes we ordered to be finished. Just writing this flog makes me want to return for more. Some of the reviews have complained about the service, but ours was quick and efficient. Water was refilled without asking and the food came quickly. Our table for two was a little small for all the food. Steve commented that we had ordered a lot and I just shrugged and smiled, knowing I would be enjoying the leftovers the next day. Parking is only metered street parking for those not blessed with a Cambridge permit, but I found a space right in front. There is no liquor license yet, so we took a leisurely stroll in to Harvard Sq to John Harvard’s Brew House, our old Tuesday night haunt for a drink. Steve loved Bow stout and we caught up with our favorite bartender, Fran. Afterwards, we ducked in to Pinkberry to see if they had my favorite flavor, salted caramel and they did! Eating froyo, walking back to the car was a perfect way to cap off date night.